For California districts, the Physical Fitness Test (PFT) 2019 has been set up as a District level Performance Based A+ Assessment to match California reporting guidelines. This document will explain how to enter scores for the PFT 2018, Grades 5, 7, and 9. 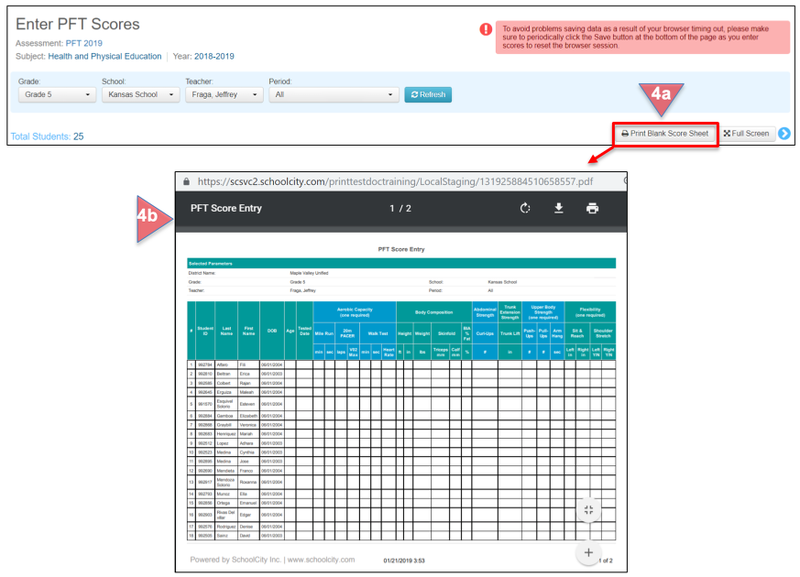 Find the PFT 2019 under the District tab in the Assessment Manager, by using the Filters to select Health and Physical Education in the Subject tab to find it in the list of assessments. Select the bolded A+ scoring icon (computer) under Functions, which will take you to the A+ scoring window, where you can enter the students’ scores. Or, From the SchoolCity Suite Launchpad, select the SCORE flip card. On the flipped side, click on Enter scores for performance based (A+), then select PFT 2019. Admin/District users may hide score columns for those categories requiring only one or two options. This can be done for each grade level separately. 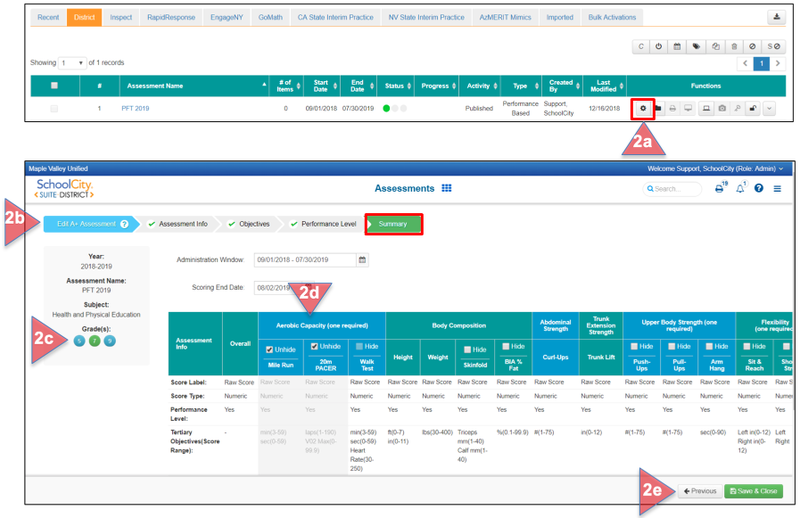 Click on the Set up icon (gear) in the Assessment Manager. In the Edit A+ Assessment screen, click on the Summary tab. Select the grade level by clicking on the circle with the desired grade. The table will adjust accordingly. Select the column(s) you wish to hide by checking the box next to Hide. The columns will be shaded in gray, and will be hidden on the scoring screen. Uncheck to Unhide. Repeat for each grade, then select Save & Close when you are done with your selections. Assessment Name, Subject, School Year. Notice to periodically save work to avoid being timed out. Search for the desired student roster by grade, school, teacher, period. Click Refresh to view results of search. Total students scheduled for the assessment based on the search results. Scoring Grid with student information and categories for entering scores. A blank score sheet may be generated in PDF format and printed for paper/pencil use by test administrators. The scores can then be entered into SchoolCity SUITE after the students’ scores have been recorded. From the Enter PFT Scores screen, select Print Blank Score Sheet. A PDF of the score sheet will be generated which can be downloaded and printed. For ease of entering scores, the Enter PFT Scores screen can be expanded to full screen. From the Enter PFT Scores screen, select Full Screen. To return to the original screen, click on Exit Full Screen. Once a testing date is entered, the students’ age will calculate automatically based on the Date of Birth, which has been preloaded into the system. If the testing date is the same for all students, enter the date in the header box, then click Apply to All. If the testing date varies per student, enter the date in the Tested Date column in the same row as the student’s name. To enter scores for a student, click inside the boxes in the row with the student’s name, and enter the score or number. The district is responsible for ensuring that the appropriate data is submitted to the state of California in the appropriate format. The SchoolCity Suite PFT 2019 is a tool to help California districts report their results. Once scores are entered into the PFT, the results can be exported to an Excel file to meet the state guidelines. In addition, the PFT data will be available for analysis in the Report Manager with the Predefined Reports - Test Results, Objective Analysis, Demographic Summary, and Summary Report.